While maintaining excellent oral health should always be a person’s top priority, Dr. Isaacson also understands that many patients want to improve the appearance of their smile as well. These goals may include brightening stained or dull enamel, altering the size or shape of certain teeth, correcting noticeable misalignments, or even altering the appearance of the gum tissue. Whatever your specific circumstances are, we offer several cosmetic services that can create truly stunning improvements for your self-image! Contact Joe Isaacson Dental in Oklahoma City today to schedule an initial consultation. Why Choose Joe Isaacson Dental for Cosmetic Dentistry? If you’re feeling overwhelmed by the number of cosmetic problems your smile is facing, a traditional porcelain veneer or Lumineer can work wonders in creating fast, comprehensive transformations. These painstakingly customized dental restorations are designed to be thin enough to cover just the front surfaces of requested teeth, hiding years of stains, chips, cracks, gaps, and more behind a flaw-free appearance you can show off proudly. Better yet, they can be completed in as little as two visits! Over time, teeth can become discolored or stained for a variety of different reasons, from simple old age and genetics to a passionate love for coffee. 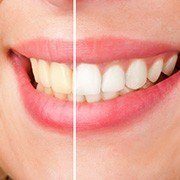 Thankfully, this discouraging dullness doesn’t have to be permanent – Dr. Isaacson can provide professional-strength whitening with the power of ZOOM 2! Here in OKC, our patients are able to dramatically brighten their enamel by several shades in just one convenient appointment. When you’re struggling with damaged or weakened teeth that require restorative care, dark-colored metals don’t have to be the norm any longer. Instead, Dr. Isaacson can design the ideal crown, inlay, or onlay that’s beautifully crafted from metal-free ceramics. These materials are so seamlessly lifelike that they actually reflect light in the same way as original tooth enamel. They’re also mercury-free and 100% biocompatible, which means they’re safe even for patients with proven allergies to dental metals. 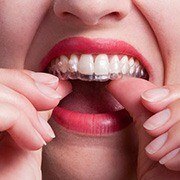 Many older patients dream of achieving straighter teeth, but they feel like they’ve already missed the boat on traditional orthodontics – after all, you don’t want to be wearing metal brackets and wires in the professional world, right? Thankfully, there’s an alternative method available for correcting noticeable gaps and misalignments. Invisalign treatment lives up to its name by providing clear, custom-made aligners that blend right in with natural teeth while gradually shifting your smile in the desired directions – no “metal mouth” required! If your teeth appear overly short or uneven, the most likely cause is an excessive amount of gum tissue. Thankfully, it’s very easy to correct “gummy” smiles here at Joe Isaacson Dental with the help of our revolutionary soft tissue laser! This technology can precisely and conservatively sculpt the natural gum line so that more beautiful dental structure is revealed to the eye and any major symmetrical issues are long-gone.